Global stock markets are galloping ahead and Japan's Nikkei index has surged by nearly 8%. 1. Jumping Japan: Investors around the world are marveling over Japan's huge one-day rally, with the Nikkei 225 index closing up 7.7%. This is the index's biggest leap in a session since October 2008. Many are speculating about the reason behind the surge, but there's no clear cut answer. "We can only conclude that either Japanese equities' pricing was irrational yesterday, or it is irrational today," said Paul Donovan, a senior economist at UBS. 2. 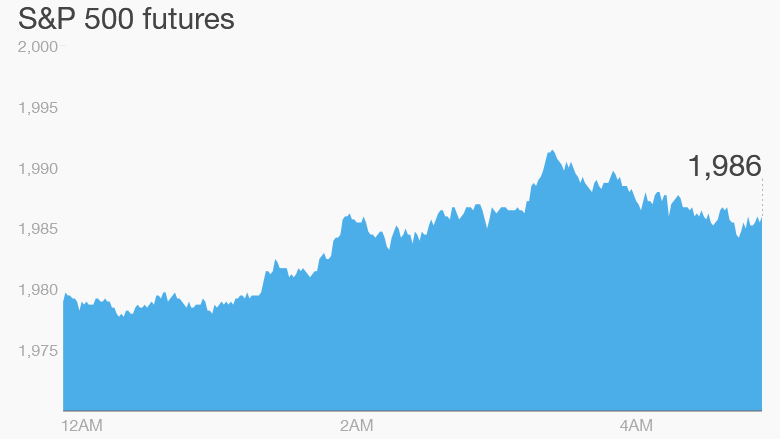 Stock market surge: Other global stock markets are also rallying Wednesday and U.S. stock futures are all up by just over 1%. Investors seem to be bidding shares higher as they pin their hopes on the possibility that the Federal Reserve will bow to pressure and hold off raising interest rates this month. The chief economist at the World Bank joined the crowd calling for a delay, telling the Financial Times that the Fed should wait until the global economy is on surer footing. In early trading, all European markets were rising by nearly 2% and all key indexes in Asia locked in solid gains. Markets also had a positive day Tuesday. The Dow Jones industrial average added 2.4%, while the S&P 500 climbed 2.5% and the Nasdaq shot up by 2.7%. 3. Apple of my eye: Apple (AAPL) shares are rising by about 1.3% premarket as investors prepare for a highly anticipated product event. The fun begins at 10 a.m. PT (1 p.m. ET) in San Francisco, and speculation about new products and offerings has been rampant. Many expect the biggest news will surround an updated Apple TV. The company is also due to update its iPhone line and could unveil a bigger iPad. 4. Stock market movers -- Yahoo, Ryanair: Shares in Yahoo (YHOO) are declining by about 2.6% premarket after the company said its planned spinoff of a big stake in Alibaba (BABA) had hit a roadblock. Yahoo told investors that the IRS rejected its request for a special tax ruling on the Alibaba deal, which was supposed to save investors huge sums of money. Shares in Ryanair (RYAAY) are soaring by about 7% in Europe after the budget airline announced annual profit would surge by 25% after a strong summer season. 5. Earnings: Barnes & Noble (BKS) is one of the key companies reporting quarterly results before the market opens. Quiksilver (ZQK) and Krispy Kreme (KKD) are among companies expected to report after the close.